Queenston Heights Park with Brock’s Monument …..
…. Steps, Wall and Bedding Plants to the entrance to Queenston Heights Park and Brock’s Monument ……. This article is about the War of 1812 heroine. Laura Secord (née Ingersoll; 13 September 1775 – 17 October 1868) was a Canadian heroine of the War of 1812. She is known for having walked 20 miles (32 km) out of American-occupied territory in 1813 to warn British forces of an impending American attack. Her contribution to the war was little known during her lifetime, but since her death she has been frequently honoured in Canada. Though Secord had no relation to it, most Canadians associate her with the Laura Secord Chocolates company, named after her on the centennial of her walk. Laura Secord’s father, Thomas Ingersoll, lived in Massachusetts and fought on the side of the Patriots during the Revolutionary War (1775–1783). In 1795 he moved his family to the Niagara region of Upper Canada after he had applied for and received a land grant. Shortly after, Laura married Loyalist James Secord, who was later seriously wounded at the Battle of Queenston Heights early in the War of 1812. While he was still recovering in 1813, the Americans invaded the Niagara Peninsula, including Queenston. During the occupation, Secord acquired information about a planned American attack, and stole away on the morning of 22 June to inform Lieutenant James FitzGibbon in the territory still controlled by the British. The information helped the British and their Mohawk warrior allies repel the invading Americans at the Battle of Beaver Dams. Her effort was forgotten until 1860, when Edward, Prince of Wales awarded the impoverished widow £100 for her service on his visit to Canada. Brock’s Monument: Brock’s monument is owned by Parks Canada and is located in Queenston Heights Park, which is maintained year-round by The Niagara Parks Commission. A self-guided tour of the Battle of Queenston Heights starts at the foot of the monument and includes a climb to the top for a magnificent view towards Lake Ontario in the north and Niagara Falls in the south. ….. The river begins to open up into forested areas instead of cliffs and rocks ……. Ken and Harriet at the Hydro Site ……. to Lake Ontario attracts millions of visitors each year. During its short course (56 km), the river drops 99 metres, with much of the spectacular plunge concentrated in a 13 km stretch of waterfalls and rapids. Water was first diverted from the Canadian side of the Niagara River for generating electricity in 1893. A small 2,200 kilowatt plant was built just above the Horseshoe Falls to power an electric railway between the communities of Queenston and Chippawa. Today the churning river provides the driving force for almost 2 million kilowatts of electricity from a number of power plants on the Canadian side. 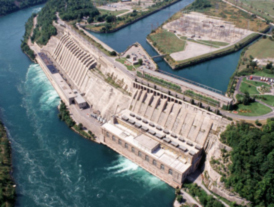 The three largest are Sir Adam Beck Niagara Generating Station Nos. 1 and 2 and the nearby pumping-generating station. On the American side of the border, down river from the Falls, the Robert Moses Niagara Power Plant and the Lewiston Pump Generating Plant, together generate more than 2.4 million kilowatts of electricity, enough to power 24 million 100-watt light bulbs. Since 1958, Sir Adam Beck Generating Station No.2 has been Ontario Power Generation’s largest and one of its most reliable hydroelectric facilities. ….. The river begins to open up into forested areas instead of cliffs and rocks ……. The rushing Niagara River just before it goes into the whirlpool then it goes ninety degrees to the general flow of the river ……. The White Water Walk lets you stroll right next to the powerful, frothing rapids. 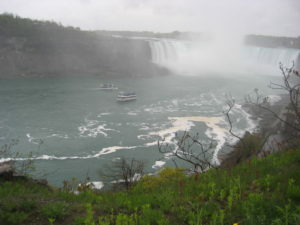 Located in the Niagara Gorge 3.2 kilometres (2 Miles) down river from the Falls, the Rapids rage and roar on their journey into the Niagara Whirlpool …. the White Water Walk …..
…. Whirlpool Cable Car goes right out over the whirling Niagara River on cables as it twirls around then goes ninety degrees to the general flow of the river ……. After coming up from the journey on the ‘Maid of the Mist’, we were walking along the kilometre long path on top the cliffs overlooking the Falls and on the Niagara River. There was an extensive park paralleling the path. Hanging plant baskets hung off the street lights, being watered by the abundant natural rainfall. 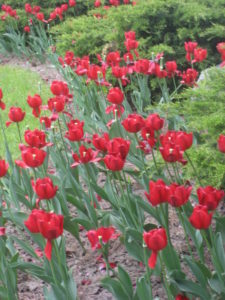 Tulips and daffodils were out in profusion in the gardens. The climate was just like a good winter day in Queensland, Australia where we had come from. We were remarking about this to local woman resident we had just met. She remarked on how it could get to minus 11 degrees in the winter time. I was sharing this experience with my friend Alan when I get home many weeks later. He then remarked that only a week before, he had met and talked with someone from Siberia. Where he lived it got down to minus 51 degrees in the winter time. The question is: What is COLD? … Walking along the kilometre ++ footpath in the Public Park overlooking the Falls …. 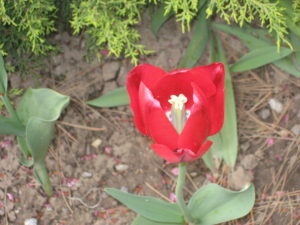 …… Tulips in flower everywhere as it was Spring in March to May in Niagara City and Canada generally ……. (sugar maple or rock maple) is a species of maple native to the hardwood forests of eastern Canada, from Nova Scotia west through Quebec and southern Ontario to southeastern Manitoba around Lake of the Woods, and the northern parts of the Central and eastern United States, from Minnesota eastward to the highlands of the eastern states. Sugar maple is best known for its bright fall foliage and for being the primary source of maple syrup. … Daffodils in flower in this garden bed …. See Images for Skylon Tower and Jay Cochrane Skywalking between the Niagara Fallsview Casino and Skylon Tower. … Awesome ! !